Posted in Misc and tagged Abortion, Pro-Choice at 10:33 am on August 22, 2014 by Broadsheet. Abortion on demand, no term limits. Bring Ireland into the 21st century. I *strongly* disagree with “no term limits”. I wouldn’t vote yes if that were part of the amendment. return to your cave, troglodite. But I’d be very iffy indeed about abortion of a seven-, eight or nine-month foetus, unless there are immutable medical reasons. That’s a great way to divide your support group. The foetus survives outside the womb after 28weeks anyways , complications aside. Women are not some vessel …. Well yeah, I mean there’d be an epidemic of women going for late term abortions for the craic – pregnancy is a right laugh up to a point, but it gets to be a bit of a bore after a bit, and everyone knows that abortion is a highly pleasurable experience, the later, the more so. Obviously, forbidding late term abortions would also stop stupid women whose foetueses have been diagnosed with fatal abnormalities acting quickly, which is good enough for them. When you say no term limits do you literally mean that or would you like to make a more sensible comment? no terms limits at all. An extremist I see. Interesting. …or divide and conquer by the opposing parties? I don’t think any country in the world has “no term limits” aborting after 30-32 weeks leaves me with serious ethical questions. Jesse, I am an Irish citizen so yes I would. Now back to the point show me another nation that has no term limits? What we need is proper medical care for women of Ireland, abortion as a contraceptive is something that should not be promoted but used as a last resort in extreme cases. we should lead the way for women’s rights, not follow other countries. you’ll be having your little colonial adventure in the middle-east, so you may not be able to vote. That depends. What will you be wearing? Hmmm…lack of capitalisation and punctuation. Howaya Helen / Breda. I’ve already nullified your vote with mine, so you are now no more relevant than this person…ahhh I love the smell of democracy in the morning! Signing off now, have a great day. And these late term abortions everyone’s suddenly worried about (gosh, that has an almost… american ring to it, almost as if the funders of Youth Defence were chatting) are still legal in the US but aren’t performed for kicks; they’re medical necessities caused by foetal malformations which are hard to detect earlier and which kill the foetus before it reaches full term (like anencephaly or hydrocephalus and if you’re human and want to sleep tonight do not image search those terms). So yes, abortion without term limits. Because if you think a woman is going to carry a foetus to eight months and then abort it for kicks… well, you *really* need to sit and think in a quiet room about that for a little while. Abortion on demand after 30 weeks as a contraceptive seems a little extreme to me I make no apologies for that. I want the 8th repealed I want proper legislation on place, if it was a straight choice between no abortion and abortion with no limits I would choose the later, but not everyone may be so willing to vote for it. Abortion after 30 weeks as a contraceptive? now the important bit, Do I think a vote on an extremely liberal abortion regime would pass NO! Are you entitled to your own opinion AISOTI? Yes. Are you entitled to your own facts? No. What facts are they? They only fact I cited is that an extremely liberal abortion law would struggle to pass at the polls. Eminently sensible post island. I agree. Well, it’s a weird way of framing it, because after a certain point, you can terminate the pregnancy, but it’s not an abortion. Even in Canada, women cannot access elective abortions after 24 weeks. That’s not for legal reasons; it’s completely legal in Canada – there just aren’t any gestational term limits in law (and they cover all this in their Health Acts, there’s no question of making it some sort of criminal affair the way we do). That’s just a fact. Finding medical facilities who will perform *elective* late-term abortions after 24 weeks is the issue that they’re talking about there. Doctors just won’t do it on a whim, there’s always a reason. And finding medical facilities who will perform late-term abortions when there is a reason isn’t a problem either, they all will – the only issue there in Canada is whether or not it’s covered by medicare and that varies by province. Jesse I am very much pro-choice. However, I believe that calling for abortion on demand will not help the cause. I think we need to stop being so black and white about this. Pro-choice but not pro-abortion on demand? Interesting. Don, that position may be more common than you think! So pro the right to choose but not when you want an abortion? That’s not really pro-choice. I’m pro choice to the point that I’m an active member of the movement in this country, and I’m not fond of the idea of “abortion as birth control”. That said, I believe that my moral compass only governs me, and the only abortion I might possibly have a say in is my wife’s, so it’s none of my goddamned business what any woman does with her body. I think it’s far more important that we get abortion in place for medical emergencies now, and get abortion on demand later if that’s more palatable for the general public. That to me is pro-choice, in that while you may have reservations or whatever, ultimately, its not your choice beyond your little window of reproduction! Also, abortion as birth control? I would like to see stats on that because I really don’t think its a thing. I may not have been clear, I’m an active member of the pro-choice movement here. 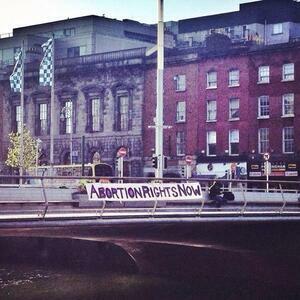 You’ll generally see me at the Abortion Rights Campaign stalls every 2 weeks. My point is that one can be staunchly pro-choice and still be personally against some level of access to abortion. And “abortion as birth control” absolutely does happen – I have no statistics for it but I know people who’ve found themselves pregnant for one reason or another and just plain not wanted to have the baby. (with the usual caveat that the plural of anecdote is not data). the reason I put the phrase in quotation marks is because it’s very much a pro-lifer talking point, and a particularly harsh way to put things. I know from your posts how involved you are – good stuff! I guess all abortion is birth control right but I’m referring to those people who think women will stop taking the pill and go out getting knocked up at the quickest opportunity just so then having an abortion without a care in the world. I suspect this is a very very small proportion of abortions. we DO need to be black and white about this. the problem has been that all of us have been skirting around the issue, politicians have been fudging the issue with ambiguous legislation and referendums. we need a clear final statement: abortion on demand, no term limits. Would that not be good enough for you Jesse. You just sound belligerent and extremist when you talk about abortion on demand. You may believe that such an outcome is what we need, however, it is simply not going to happen. You can continue to ignore reality or enter an open and reasonable debate on this issue to try and find something that would be workable and most important something that the Irish people would vote for. There simply will not be an outcome here that pleases everyone. Put another way, the extremists on the left and the right need to get off the stage and the vast majority who are currently in the middle and torn on what is best to do need to stand up and take control here. what will happen when a woman near full term needs an abortion to save her life? if we go for the compromise position, that woman will be left to die. let’s get our heads out of the sand. abortion on demand, no term limits. Jesse (Helen), abortion when deemed medically required can be legislated for without legislating for abortion on demand up to termination. You would get a ‘termination’ of the pregnancy ie a birth/c-section in that case. As bad as the Ionanists! Just a flip of the coin. Good. Keep it up everyone! They forgot to colour in the the second ‘R’ and the third ‘O’ …FFS ! Less of your lip, drop the banner, and give me 40 ! classy stuff on the no term limit. Do the pro choice people see any circumstance under which an abortion would not be allowed? Do the pro life people see any circumstance under which an abortion should be allowed? I think these are the only questions people should consider. The rest is dodging the issue. Abortion on demand to all, or a total ban for all. You compromise when two sides have to live with a decision that materially affects both of them. So unions and management compromise, that sort of thing. Compromising on human rights, however… that’s not a great idea. Well exactly. Most of the calls for term limits seem to be based on squeamishness (and those of us who are, or have been, pregnant can’t afford that luxury) or some fear that if you let the ladies do exactly what they want, all hell will break loose. At heart, there’s a real reluctance to see women as fully competent to make these decisions without strong legal guidance. It’s amazing we’re trusted to get pregnant at all. Not on demand, up to 2 and a half months. After that, if the woman’s life is in danger, she comes first. If anything, this is what the referendum will achieve. While not ideal (I do think a women should be allowed to have abortion whatever), it is a good clear place to be rather than the mess at the moment. 10 weeks is BS. No possible reason for this to be concern for the foetus and this severely limits the time a woman has to get an abortion. In terms of access to healthcare in Ireland 4 weeks is sweet FA. Hang on. If you’re not on the pill or are depending on condoms then if you are late by even a few days, you panic about being pregnant. Well, I’m using myself as a gauge here but I’m guessing I’m not unusual. Cheap pregnancy tests cost eff all. No, you’re not unusual, but you’re not universal either. A lot of vulnerable people won’t have regular periods, or access to pregnancy tests. Some of them will be twelve. Some of them won’t have money. Some of them won’t speak English, or know that a test exists. We can’t just make laws for people roughly like us. A lot of people are in abusive relationships and would fear for their safety if their partner found a pregnancy test in the bin. Yeah, 10 weeks wouldn’t be my limit. There will be a limit in general – should be same as the UK. I’m curious Don, how many weeks is your limit and how many abortions have you had to find out where that limit was? I need to have had an abortion to have an opinion?! FFS Mark, sometimes you are an idiot. 2.5 months? Aka 10 weeks aka long before many women discover they’re even pregnant? 4-6 weeks, usually. Also, if you’d been raped, I would imagine you would be very vigilant about checking to see if you were pregnant. Someone who’s been raped might just as easily attribute her missed periods to distress; the body can shut down periods in extreme distress. Ah, you MIGHT do that, but surely the (horrendous) threat of pregnancy would be foremost in your mind? Ah, I’ve no idea, really. You might well do that if that’s what your doctor tells you can happen. If it’s not on demand then how would that work? Surely the only way an abortion would happen in that scenario would be if the woman’s life is in danger, in which case the two and half months bit is pointless. It’s funny how Helen/Jesse is absolutely no different from ABM yet one gets derided (rightly) and abused and one is reasoned and agreed with. Jesse is on the opposite end of the spectrum to ABM, at least on this topic. And Jesse is relatively new compared to ABM, or at least I for one am not as familiar with Jesse’s excesses (sorry). No doubt. The level of engagement with ABM here, derisive or not, is hard to justify.